Permanent makeup also known as micropigmentation is the art of implanting dyes or pigments with a needle in the dermis of the skin to enhance certain facial features. Permanent cosmetic makeup is still considered a tattoo and the most common areas that are tattooed are eyebrows, the lash line, and lips. When permanent make-up is not applied correctly it can be quite disconcerting to a patient. Complaints may include inappropriate colors, harsh shapes that are misplaced, irregular eyebrows, crooked lipliner and eyeliner that has migrated. Whether it’s the color or the shape that is unsatisfactory, permanent makeup can be a challenge to remove. While the process for removing permanent cosmetics is similar to tattoo removal, there are significant differences. Pigments can undergo an oxidation reduction reaction. Sun exposure can also lead to decomposition and changes in color of the tattoo. More serious complications could include infection, granulomas and allergic reactions. Permanent makeup removal with laser tattoo removal treatments often requires more than one type of laser or different methods of tattoo removal that don’t include lasers. The colors used in the permanent makeup are the main factor that determines the type of laser used or method of removal. Black colored tattoos are the easiest to remove even though it can take several treatments to achieve results. Some lighter color cosmetic pigments have metallic bases. When the laser comes in contact with this type of ink, it can turn black. Attempting to remove it with laser can cause even further problems. If it is brown, or lighter there is always a chance that the pigments can oxidize with treatment and actually become darker. The type of pigment has a lot to do with how long the permanent makeup will last as well. Test treatments must be done prior to further removal in case titanium dioxide was used. 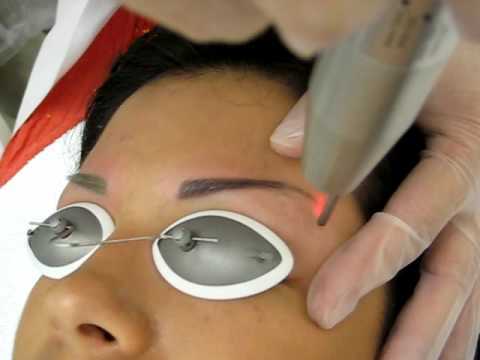 It should also be noted that Laser tattoo removal is known to remove the hair from eyebrows affecting the hair follicles and a person may lose hair permanently. Great care must be taken for removing eyeliner as laser use can also damage the eyes. Eye shields must be worn and performed by a highly trained specialist with experience.. When considering permanent makeup, do your research into this industry, bear in mind Permanent Cosmetics is a form of tattooing and must be thought of as lifelong. For more information on Permant Make-up and Micropigentation visit https://www.lastinglooks.ca/permanent-cosmetics-microblading-toronto/.